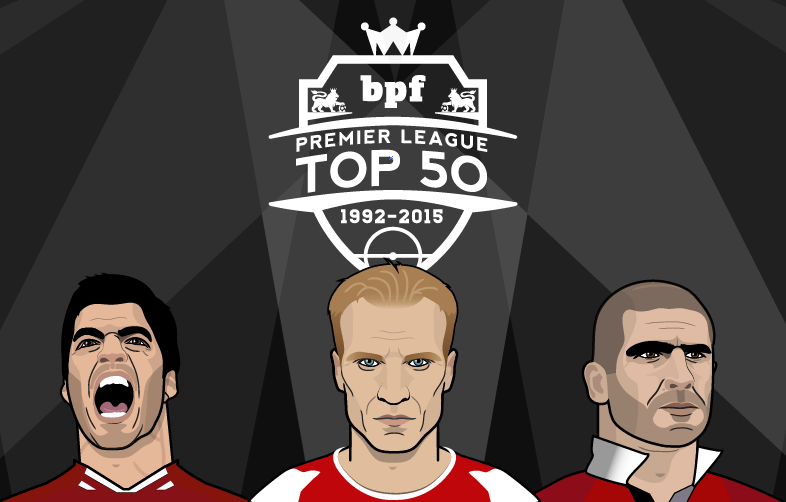 The BPF Top 50 feature is back for 2015, this time focusing on the history of the Premier League, and we need your help to put it together. With Lionel Messi and Cristiano Ronaldo continuing to dominate awards in the current game, including the Top 50, we decided to mix things up and get some debate going. The Premier League has been graced by some amazing players over the course of its 23 seasons and now we want to hear your thoughts on the standouts. To submit a vote, download the excel file at the link below, choose your Top 30 and send it to us at editor@backpagefootball.com. Votes are awarded to each player on the list you submit (30 for first, 29 for second, and so on), and the 50 players who get the most votes will feature in the final countdown to begin next month. Remember, this is based on all Premier League seasons up to and including 2014/15, a purple patch in the current campaign counts for nothing. To make the Top 50 happen, we also need people to write profiles for each of the players in the countdown. If you want to get involved, drop us an email on editor@backpagefootball.com with the details below. We will then get back to you once the voting has begun and we know what teams and players need covering. Voting is now open for the Top 50 and you have until Saturday, October 31, to submit your Top 30. The closing date for potential contributors to express an interest in getting involved is Wednesday, October 28. The Top 50 will be revealed gradually in late November and early December. If you have any issues or questions, email us or send us a tweet @bpfootball.